In the present days, there is very tough competition to get government sector services as compare to the private sector services. Similarly, there is very tough to select the best books as compare to go through the book, which is useful to get the government sector services. Before sitting in any competitive examination, you have to be able to get or to do that job. To become able, you have to be sincere about the competitive examinations. The students never crack any competitive examination without follow the sincerity or ability. After that the students need to select the book. In point of selection of book, this book is more helpful to crack the P.O. exam. The book contains the previous years solved papers of almost all Public Sector Banks and also contains the IBPS CWE and Gramin Banks. There is very huge collection of questions of previous years solved papers asked in various exams. In my opinion, this is sufficient collection of questions to do practice. It proves from this thing that the book containing more than 900 pages. The book is based on Probationary Officers exams so, it is crystal clear that the collection of questions will be difficulty level which is the demand to become P.O. I think, this book will also improve your mental ability. 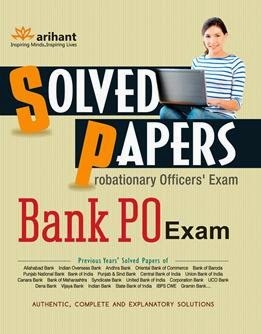 By attempt and solve the questions of this book, you will be able to become Probationary Officer in banks because the book contains every basic, difficulty level and huge difficulty level aspects which are the need to prepare the students for P.O. The additional benefit of this book is that you will prepare for P.O. along with other government sector services. There is no need to buy any more book. The book containing sections Reasoning, English Language, Quantitative Aptitude, Data Analysis & Interpretation, General Awareness, Banking Awareness, Marketing Aptitude, Computer Knowledge. The very important section of the book is Data Analysis & Interpreration. By practice the questions of Data Analysis & Interpreation Section, the students will reach at the door step of success. The section will also help the students to prepare the section Quantitative Aptitude. I am very sure to say that if any student solve the questions of the book honestly, he/she will reach very close to become P.O. The paper and printing quality is also very good. There is no hindrance to read the book.